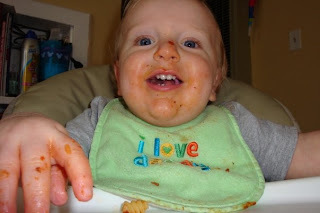 The first few times Noah had spaghetti he could take it or leave it. He barely finished it. Well we had some rotini pasta with meatballs and ofcourse marina and he loved it! Maybe he just didn't like angel hair pasta? Go figure. 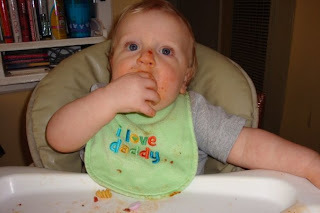 Anyway, whenever he eats spaghetti it's a complete mess. I'm talking about having to clean his whole high chair and ofcourse him from head to toe after. It's rather gross, but he seems to love it! Whenever Noah thinks he is very funny he starts talking in his "monster" voice. It's a pretty scary voice for a toddler to have, but he thinks it's hilarious. This is why we named him the spaghetti monster!